Digital Marketing gives organizations access to consumers anytime, anyplace, and gives consumers an equal voice in the conversation about your products and services. Digital Marketing is near real-time, generally cheaper than traditional media and is rising at a rate roughly equivalent to the rate of mobile internet users. Brands that dismiss the relevance of digital marketing do so at their own peril. 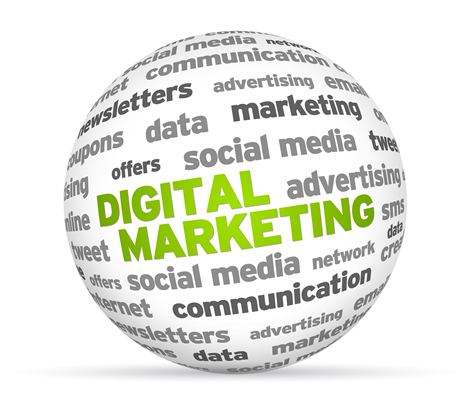 Digital Marketing is not a single, monolithic entity, it is as diversified as the number and the style of smartphones, tablets, laptops and desktops that are used to create and consume digital marketing messages. Like any other marketing tool, successful digital marketing begins by creating a strategy, developing a budget and defining the target audience. Knowing the audience is important because while all digital channels are availablefor marketing, businesses and consumers gravitate to certain channels for different types of information. For example, Twitter is the top go-to channel for the press and entertainment industries and brands that use emotions and images to sell, (think fashion and food) should think first of Facebook. Google+ still struggles to gain mind-share but because its Google, it should be considered as part of any search optimization plan. E-mail is sometimes overlooked because of its age, but e-mail enjoys the highest penetration rate and The Radicati Group predicts that the number of email accounts worldwide will increase 6% for the period 2013-2017. Most businesses will employ multiple channels. Understanding the channels most used by the target audience will help set priorities for spending and staff allocation. Owned – For example, the content and frequency of brand messages sent via e-mail are controlled by the company. Paid – Includes pay-per-click, advertisements. The message content is controlled by the brand, the frequency or reach of the message is influenced by competitors who will outbid the brand for target keywords. Earned – Brand message content posted to the company website or via social media can be crafted by the brand, however, consumers can influence the brand message by commenting on social media pages or product and service reviews websites such as Yelp. The brand response to reviews is critical to maintaining a positive brand image. Not all digital channels are appropriate for all audiences.